VANCOUVER, British Columbia, Jan. 02, 2019 (GLOBE NEWSWIRE) -- FIREWEED ZINC LTD. (“Fireweed” or the “Company”) (TSXV: FWZ) is pleased to provide a year-end review of its 2018 results and work program on the Macmillan Pass Zinc Project in Yukon, Canada. In January 2018, Fireweed published new expanded Mineral Resources making it the largest undeveloped zinc and lead resource in the world held by a junior company with 11.2 Mt at 9.6% ZnEq Indicated plus 39.5 Mt at 10.0% ZnEq Inferred for the combined Tom and Jason deposits. In May, Fireweed published a Preliminary Economic Assessment with robust economics including an after-tax NPV (8%) of C$448M and IRR of 24%. Drilling in 2018 confirmed and expanded on historic drill results with a number of holes intersecting notably higher grades than projected from historic data. Highlights include drill hole TS18-005 which intersected 12.61% Zinc, 16.40% Lead and 221 g/t Silver over a true width of 12.73 metres. Other wide, high-grade intersections are compiled in the tables below. Extensive geophysical ground gravity and passive seismic surveys, geochemical sampling and geological mapping were carried out to identify additional high priority targets for exploration. Results and exploration targets outlined will be released when interpretation work is complete. The identified high priority targets will be included in planning for the 2019 summer drill campaign. In early 2018, Fireweed exercised its option and became 100% owner of the Tom and Jason claims and associated deposits and assets. Later in 2018, Fireweed consolidated the Macmillan Pass Zinc District with the purchase and options on several blocks of adjacent claims expanding its land position from 219 square kilometres to 544 square kilometres (210 square miles). In early 2018, Fireweed closed a $12.5 million financing. * See 2018 Fireweed news releases for details and background information. After reviewing these year-end results, Fireweed CEO Brandon Macdonald stated “It has been another busy year of great accomplishments for Fireweed. In January we published new Mineral Resources which establish Tom and Jason as the largest undeveloped zinc and lead resource in the world held by a junior company. In May we published the results of a PEA study which show the project to have robust economics. These were followed by another successful season of drilling which returned many wide intersections of high-grade mineralization at Tom West and Tom East. We also drilled our first holes on the historic End Zone which returned impressive intersections not yet included in the Mineral Resource. Beyond the technical work, we consolidated the Macmillan Pass Zinc District with the acquisition of additional claim blocks which more than doubled our land position to 544 square kilometres. This expansion included the purchase of the Nidd claims with which Fireweed now owns all four known large zinc systems in the district. Plans for another active season in 2019 will be finalized after we complete the compilation and interpretation of the results from the 2018 program. Details and supporting information are provided in the NI43-101 Technical Report posted on www.sedar.com and in the Company’s news release, both dated January 10, 2018. On May 23, 2018, the Company announced the positive results of an independent NI43-101-compliant Preliminary Economic Assessment (“PEA”) for the Tom and Jason deposits prepared by JDS Energy and Mining, Inc. (JDS) with work on tailings and water by Knight Piesold Consulting, both of Vancouver, Canada, utilizing the 2018 mineral resources above. 18-year mine life with 32.7 Mt of mineralization mined at 4,900 tonne-per-day average processing rate. 1.54 Mt of Zinc, 0.88 Mt of Lead, and 37 Moz of Silver in concentrate shipped. Average yearly contained-metal production of 85 kt Zinc, 48 kt Lead and 2 Moz Silver. Details and supporting information are provided in the NI43-101 compliant PEA Technical Report dated July 6, 2018 (effective date May 23, 2018) posted on www.sedar.com and in the Company’s news release dated May 23, 2018. TS18-001 No zone intersected. Intersected fault where zone was projected3. TS18-006 No zone intersected. Intersected fault where zone was projected3. TS18-009 Intersected fault where zone was projected. TS18-013 Exploration hole on geophysical target. No zone intersected. Maps and sections of these drill holes are available on the Fireweed website at www.FireweedZinc.com. True Width is estimated from the company&apos;s current understanding of the orientation of the mineralized bodies in the area of the drill intersections and will be refined when the final geological model is completed. A historic 1990 drill hole intersected a wide section of the Tom West Zone (14.1% Zn across 14.6m) on the other side of this fault at depth. These 2018 drill holes will allow precise location of this fault in planning future drilling of the Tom West Zone on the other side of this fault. One drill hole was attempted at Jason South in 2018 but no zone was intersected as the drill hole passed between two projected zones in a fault. Details on these drill intersections and assay methods can be found in recent Fireweed news releases. In addition, core from 2018 was logged for geomechanical characteristics prior to sampling to aid in future mine planning and engineering. Field work in 2018 began with geophysical surveying and geochemical sampling orientation grids in the Tom, Jason and End Zone areas to optimize exploration methodologies. This test work demonstrated that geophysical ground gravity surveying complemented with passive seismic, and geochemical B/C horizon and soil gas hydrocarbon soil sampling, all guided by geological mapping and modern exploration concepts, are effective techniques to detect zinc-lead-silver mineralization in the district and efficiently focus targets for drilling. Over the balance of the field season, large gravity and soil sampling grids were completed complemented by geological mapping. Currently, interpretation of the results of the mapping, geochemistry and geophysics work from the 2018 field season are being carried out toward identifying high priority areas for exploration toward future new discoveries. Results and exploration targets outlined will be released when interpretation work is complete. In total, a crew of about 40 persons were in camp in 2018 carrying out the drilling and field work program. During the summer the camp was expanded from a 20-person camp to a 50-person camp with a new septic system, additional trailers and facilities, and a renewed permit valid until 2028 to allow for expanded drilling and exploration activities in the future. 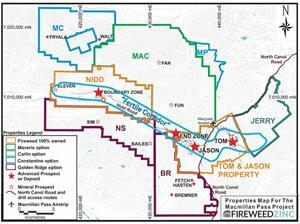 During 2018, Fireweed exercised the Tom and Jason option and acquired several adjacent claim blocks to consolidate the Macmillan Pass Zinc District under Fireweed’s name and expand the Macmillan Pass Project land position from 219 km2 to 544 km2. In February 2018, Fireweed exercised its option and acquired 100% interest in the claims which host the Tom and Jason deposits. In March 2018, Fireweed optioned a number of adjacent claim blocks (MAC, MC, MP, Jerry, BR and NS) which cover exploration targets in the district where previous work identified zinc, lead and silver geochemical anomalies in critical host geology. In November 2018, Fireweed purchased 100% interest in the Nidd claims covering part of the Fertile Corridor of highly prospective geology on the northwest extension of the Tom-Jason-End Zone stratigraphy, including the Boundary Zone which is the fourth large known zinc zone in the district. Descriptions of these properties and details of the agreements are in recent Fireweed news releases and MD&A’s available at www.sedar.com and on the Company website at www.FireweedZinc.com. Plans for an active 2019 exploration program will include drilling of further step out holes, drilling of new exploration targets defined in 2018 and field work toward development of additional exploration targets on the expanded property. Details of 2019 work plans will be announced when the interpretation of 2018 field work is completed and budgets are approved. Drill results in this news release have been reviewed and approved by Gilles Dessureau, P.Geo, Vice President Exploration and a ‘Qualified Person’ as defined under Canadian National Instrument 43‑101. Other technical information in this news release has been reviewed and approved by Brandon Macdonald, P.Geo, CEO and a ‘Qualified Person’ as defined under Canadian National Instrument 43‑101.